Second, I have some new products in my Bandcamp store. You can now get the Firefly Drinking Songs songbook, which features all of the lyrics from Firefly Drinking Songs, my new album, As Long As I'm Flyin, and the Bedlam Bards' Firefly album On the Drift, plus a few lyrics that have not been recorded yet by Cedric and Rie Sheridan Rose, who co-wrote my Firefly album. This will make it easy for you to sing-along with us. On Saturday, I released the Celtic Music 6-Pack. This is a compilation of six Celtic CDs, including: Kilted For Her Pleasure, Scottish Songs of Drinking & Rebellion, Not Every Day Is St Patrick's Day, Happy Songs of Death, The Bridge, and How America Saved Irish Music. If you're looking for a great intro to Celtic songs or my music, this is it. And it's at one low price! I had a great interview on the Sending a Wave UK Firefly Podcast that just came out. In it, I had some exciting realizations about how I write songs, especially in regards to Firefly and Lord of the Rings. Finally, I created a fun Firefly Drinking Songs Playlist on Spotify. It's packed full of songs inspired by Firefly. I hope you will follow, listen, and share it. One of my most-popular songs since 2009 is a song called "Close Your Eyes". It's commonly known as "The Demon Lulllaby". The song was written in 2003 by filker, Daniel Glasser. It won Best Comedy Song in the 2008 Pegasus Awards. That's also the year, I first heard the song. It was a I-Con Science Fiction Convention in Stony Brook, New York. I remember those filk circles fairly well. Now if you're not familiar with the word filk, that is the music of fandom. It's the music you hear at science fiction conventions. The word was first used as a misprint of folk music that was happening at conventions back in the '50s. I guess con goers liked the term, because next thing you know, filk circles exploded. The filk circles at I-Con were my first. My old band, Brobdingnagian Bards, were invited to be guests at I-Con back in 2002, I believe. I saw Emerald Rose was performing there and thought, "why on earth is a Celtic band like us playing at science fiction convention". So I booked us and realize con goers love Celtic music, and that we were also playing filk, with songs like "Do Virgins Taste Better" and "If I Had A Million Ducats". Any case, we were invited to the I-Con Filk Circle. We sang our songs and began building an audience. 2008 was our last year at the convention before we broke up. I don't remember who sang "Close Your Eyes". But I loved it. After we parted ways, I did an internet search to find the song. Lo and behold, I found it on the Pegasus Awards website. I contacted Daniel Glasser and asked if I could record the song. He was extremely generous to say yes. I had never played the song live when I recorded it in January 2009 for my CD Kilted For Her Pleasure on the North Shore in Louisiana at my friend Jamie Haeuser's house. Jamie recorded percussion on a couple of tracks for that album. As a lullaby, I kept the song pretty barebones, just me and the autoharp. And it worked. As I played it at shows, it was an immediate favorite. "The demons in your bed, are gonna eat you up". One of my most-memorable moments was performing it a giant ballroom at Dragon Con in 2009. The stage was simple with me dressed in my black kilt, long hair flowing, the enormous sideburns, and an autoharp as I sang the song, pausing for comedic effect. (YouTube video)The audience was in tears by the end. It was a brilliant start to my solo career. The song was an obvious hit. I'm gonna play the song for you right now. And then I'll share the filk of the song in a moment. In 2010, my first daughter was born--Kenzie. Having a daughter made this song even better. Not only do I like singing it to her. But there's no better way of finishing the song and stating, "If you enjoy this song, then your CD purchases help to pay for my daughter's therapy when she grows up." Well, if she wasn't disturbed, then she has been when I filked the filk. I think it was 2014 when I first filked "Close Your Eyes". The song was already popular at my many shows. I started performing it at my Firefly Drinking Songs show at Gen Con the year before. It was well-loved. Now when I'm up on stage, I'm always looking to use things from the moment to include in the show. Some people complain about hecklers. I don't think I've ever met a heckler I didn't like. They just give me ammo to improve my show. The year before "Close Your Eyes" was a hit. But could I make it funnier? 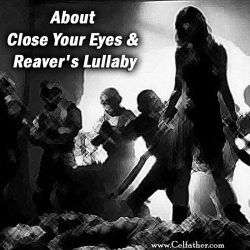 There are... reavers in your dreams. Reavers! Hey that works! I remember thinking. I can't tell you why I decided to change the next line. But the response was mind-blowing. Are gonna eat your face! The room erupted. Those who knew the original song already thought it was funny. But the visual of the horrifying reavers eating someone's face... well, it worked! Over the next few years, I tried changing the lyrics more to suit Firefly, but they never really came. Meanwhile, several Browncoats kept asking, "when are going to record that song?!" I set a Milestone on Patreon in 2017. If I raised enough money, I would record the song for a short EP. The goal was met. I sat down to record the song and ended up recording a whole bunch of Firefly songs. Lo and behold I had a new album. The album is called As Long As I'm Flyin'. It will be officially released on March 6, 2018. March is the only month that you will be able to buy a physical copy of the album online for the foreseeable future. So mark your calendar. If you want a download of the album, along with a bunch of notes about it, become a Patron of music. JOIN THE GUNN RUNNERS CLUB ON PATREON! Or mark your calendar for March 6th. You'll be able to buy it everywhere online. And you can stream it through Spotify. I would deeply appreciate it if you would help me spread the word. You can share this podcast. Of course, my previous Firefly album with Bedlam Bards, Firefly Drinking Songs, is on sale. If you ever wanted to experience what it's like going to a pub in Canton on Higgin's Moon, you want to own this album. Finally, if you're not yet subscribed to Celtfather Music & Travel, I plan to have more shows just like this coming out in the future. Go to Celtfather.com for details.